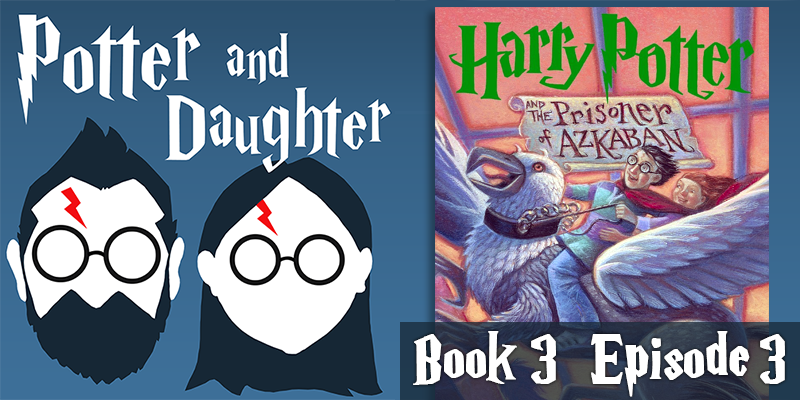 In the tenth episode of Potter And Daughter, Joel and Lily attempt to cover the remainder of book 3, Harry Potter And The Prisoner of Azkaban, but only manage to get through chapters 15-18 in an hour. There’s just too much to talk about in the final riveting act of this book (which happens to be my wife’s and Lily’s mother’s favorite in the series). “Like what?” you ask. Like the Quidditch final between Slytherin and Gryffindor, O.W.L.s and N.E.W.T.s, the fate of Buckbeak, Professor Trelawney’s ever more grim and specific predictions for Harry’s future, Harry’s first (and final?) confrontation with the notorious Sirius Black, unexpected revelations from Professor Lupin (several, actually) and the truth about Order Of Merlin First Class award recipient Peter Pettigrew! NO ONE IS YET AS NERDANTIC* AS ME. Though since I’m like a month behind on the podcast, maybe you’ve looked this up already. O.W.L.s (Ordinary Wizarding Levels) are taken only in the fifth year. They determine where your aptitude lies and what courses you may take in the two years before … graduation? I just realized that she never gives us a glimpse of how Hogwarts celebrates seventh years completing their formal education. The OWLs and NEWTs are meant to correspond to the UK system of GCSEs and Alevels. You take GCSEs (General Certificate of Secondary Education) to pass school and get into sixth form. It (when I did them) is normal to take 10 to 12. You take A (Advanced) levels to pass sixth form and get into University. When I did them you took 3 or 4 and could do half A levels, but now the system is you take like six AS levels and then 3 of them you take further to A level. Hope that helps! Didn’t mean to reply, was meant to be a general comment! Hello UK listener here! The OWLS and NEWTS are the equivalent of the UK exams GCSEs or probably O Level when Prisoner of Azkaban which you take when you are 16 and A Levels which you take when you are 18. Everyone has to take GCSEs but A Levels are optional. Im not sure what the deal at Hogwarts would be with regards to leaving school at 16 which you can do at GCSE level but the exams that Harry and the gang were taking definitely wouldn’t have been OWLS. I hope thats helpful!! Sorry that should have said when Prisoner of Azkaban is set!